After falling in love with both Pino Daniele and Gomorrah simultaneously (and for very different reasons! 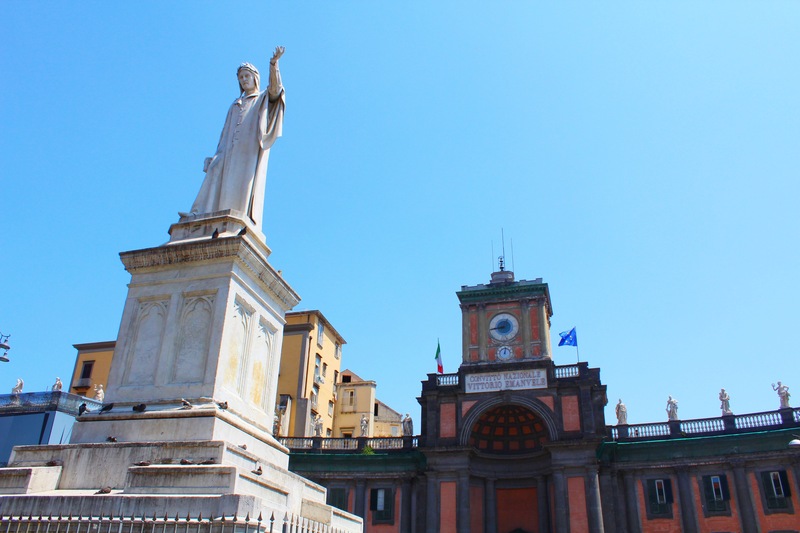 ), I felt like I needed to see the city of Naples for myself. Gomorrah is the mafia thriller series that I’ve been hooked on. I didn’t imagine that it would be particularly my mind of programme to watch, but it was in Italian on Amazon Prime Video so I figured I’d give it a go. It. Is. Incredible. I devoured Series 1, and couldn’t wait for Season 2 to start. It’s gritty, it’s raw, but it’s also very, very human and I love it. The actors are all believable, and the soundtrack is one of the best I’ve heard in a long time, gripping and atmospheric. Pino Daniele on the other hand was a loveable singer from Naples who sang often in local Napoli dialect. His voice is very distinctive. I remember the first time I heard him. I was listening to a playlist of Italian songs that a friend had made me on shuffle at work. Suddely a song came on, and the voice just floored me. I looked at the name – Pino. Googled him, and in that instant felt absolutely gutted that he had died earlier that year and that I would never get the chance to see him live in concert. A bizarre instant emotion, and I’ve loved his voice and songs ever since. So, here I was in Naples. Before I came, people told me, “Oh, it’s supposed to be rough there, be careful” based, no doubt on the mafia tales. My dad told me an amusing story of when he’d landed here once, which I better not repeat! So before I came, I was absolutely intrigued and not sure what to expect. The first thing you feel, when you get off the plane, is that Napoli is enveloping you in a big hug. That’s how I felt anyway. An all encompassing embrace. It’s big, it’s dirty, it’s noisy, and it’s not all beautiful. But it’s got soul. Tons of it. Naples is one of those cities that you just can’t help being absorbed into. You quickly feel like a local. There’s the odd conman who will try and swindle you out of a few Euros in exchange for a sorry tale of a starving family, but he’ll do it with such familiarity and charm that you actually don’t mind. We visited the Sotterranea on a recommendation from a friend. I’ve visited similar attractions in Lecce and Gravina, Gravina being my hands down absolute favourite, so it had a lot to beat. It was impressive, the underground wells much bigger than Gravina, and the guide was knowledgable and entertaining, but personally, Gravina still wins in my eyes. Naples is the city that takes is football as seriously as its religion. 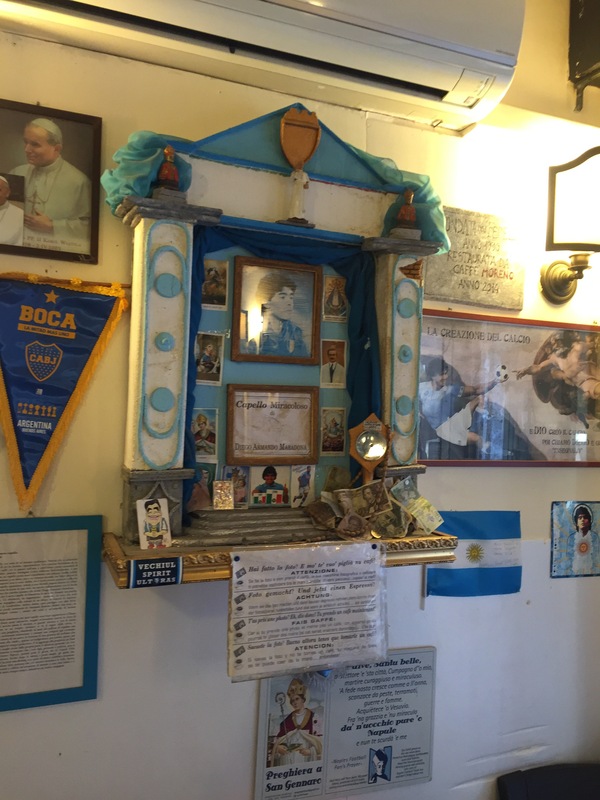 A friend told me that there’s a curl from Maradona’s head (the Argentinian footalling legend who played for Napoli) and they’ve built a shrine around it…so I had to go find it. Bar Nilo is where you need to head to. A small unassuming bar off a busy Napolitan street in the heart of Centro Storico, hosts the small shrine. Well, any excuse to savour a Napolitan coffee is welcomed. 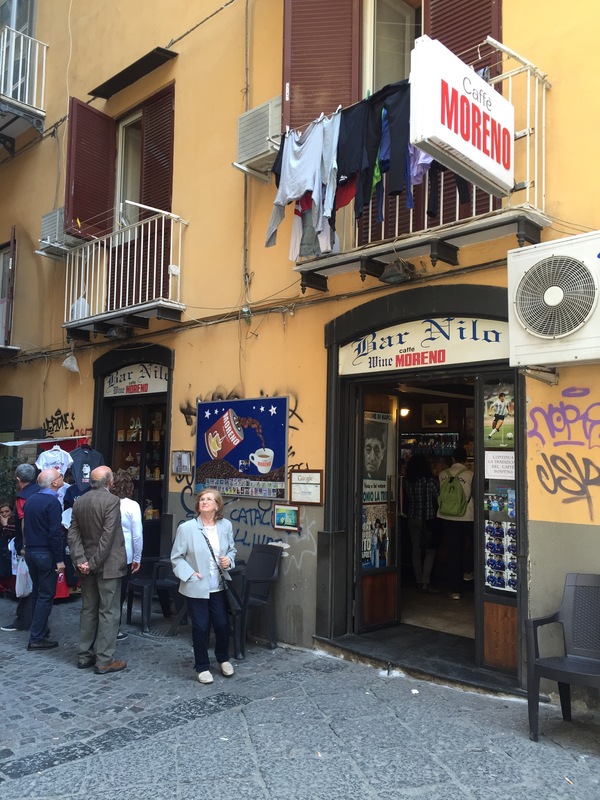 The attitude of the people of Naples to football, is a mirror of their attitude to life. Furvent. It’s evident just walking down the busy market streets as vendors shout to over one another and to entice potential customers, it’s there when you walk the dirty backstreets around Piazza Garibaldi tripping over bags of rubbish and homeless guys sleeping in doorways, but it’s also there in the laugh of the bar man who serves you his finest coffee, it’s in the pride of the smile of the lady in the pasticceria who wraps up a cake for you to take home a slice of Naples, and it’s infectious. 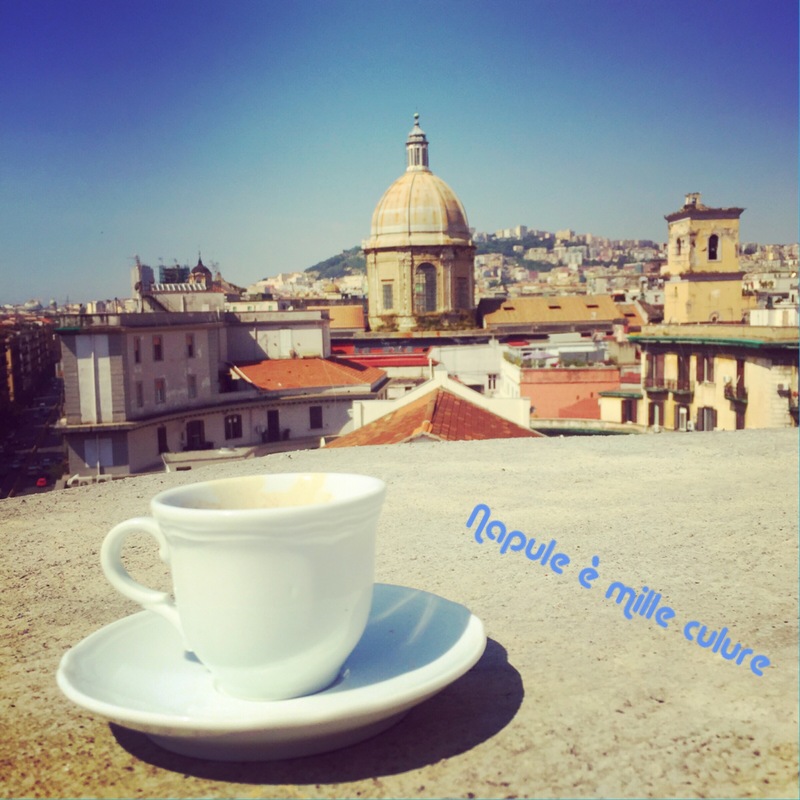 Goeth once said: “Vedi Napoli e poi muori” – See Naples and then die. Well, I’m not ready to die yet. I need to go back! Naples is intense and seems to evoke strong emotions in people of either love or hate. I’m so happy you had a great experience! I, personally, am a little intimidated by Naples, but maybe I’ll give it another chance one day. So much beauty in Italy. Thanks for your recent visit to my blog.